Defender X1 picks up ball handler O1 before or at mid court and overplays, forcing the ball towards a sideline. When the dribbler is 3 strides away from X2, X2 completes the trap by running under control with hands up towards the dribbler's outside shoulder (making it more difficult to avoid or pass over the trap). The defender who comes to trap is replaced by her nearest teammate, who is often in the best position to steal and is in turn replaced by another defender. Here X4 rotates to prevent a pass to X2's check. Weak side helper X5 rotates to prevent a pass to the ball side post, but is also the safety protecting the basket in the gap between O4 and O5. X3 continues to deny a pass to O3. These are the positions once the trap is set and rotation has occurred. X1 and X2 form a V pointing away from the basket, and are toe-to-toe so that O1 can't step through and split the trap. X3 and X4 are interceptors and X5 is the safety. If the attackers complete a pass out of the trap, the defenders must recover to their checks as quickly as possible (sprint out of traps), and be prepared to defend temporarily in a disadvantage (outnumbered) situation. The easiest rotation may be for the trapper to pick up the nearest open attacker. If traps are intended to contain and slow down the attackers, rather than to intercept passes, the defenders not involved in the trap create a help side Triangle to protect the basket. Here X4 would not rotate up to pick up O2, and X3 would sag off her check to the foul line. If the ball is on the wing, the defense should force the ball handler to the corner, or to a baseline cut-off point 2 to 3 yards outside the lane. The ball side post defender moves to trap and is immediately replaced by weak side helper X5, and weak side wing X3 drops down to pick up X5's check. X1 is not involved in the rotation, and continues to prevent a pass to O1. Here are the positions after trapping and rotating. Attacker O3, furthest from the ball, is not guarded. If the attackers show that they can hit the open player, or for containment, X1 would move to the foul line to create a help side Triangle with X3 and X5, and attempt to cut off passes to both O1 and O3 by playing in the gap between them. Automatic trapping can also be used to defend a ball screen (pick and roll). The defender on screener O2 traps as ball handler O1 draws even with the screen. The screener is picked up by the nearest defender and the defense rotates to leave the least dangerous player open. An early sideline trap can be used as an alternative to the baseline trap. 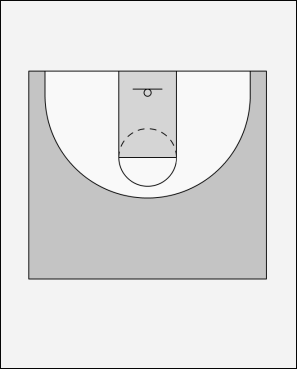 As soon as the ball is dribbled or received below the free-throw line extended, the nearest defender steps out to make a sideline trap with the on-ball defender, and the weak side defenders rotate. Again, for containment X1 could sag towards the foul line into the gap between O1 and O3, creating a help side defensive Triangle. Here are the positions after rotation to create a helpside Triangle.